When coffee is used as body scrub with other high quality natural ingredients, it can leave your skin looking younger and fresher, feeling soft and healthy. There is nothing quite like the smell of morning coffee to wake you up in the morning and few people take into consideration all the properties of coffee that actually make it a great ingredient to use for skin care. As surprising as it may seem, coffee contains a lot of properties beneficial to your skin from anti-oxidants that help to slow down the signs of aging to promoting moisture retention, working as chemical free sun protection and reducing the appearance of cellulite. So, here is a look at some of the best Coffee body scrub reviews we have selected. 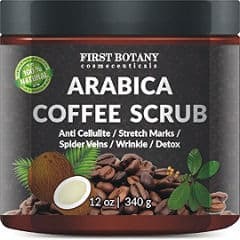 The Botany Cosmeceuticals Arabica Coffee Scrub comes in a 8.8 ounce jar and contains totally natural ingredients such as organic Kona coffee, Coffee Arabica seed oil, coconut and cocoa extract, dead sea salt, organic olive, almond, and grape seed oil as well as Shea Butter. This product is very popular among users, it is made in the USA and followed by a 100% money back guarantee. It has a rich coffee scent and, according to the company, it offers a number of skin benefits such as exfoliating skin, restoring elasticity, increasing circulation, reducing fine lines and inflammation, evening skin tone, brightening as well as softening the skin. Therefore, it is suitable for removing cellulite, fighting premature aging and sun spots, lightening scars as well as helping with stretch marks and spider veins. This product needs to be kept dry. It has a granular texture and it works best if you take a little out of the container and mix it with a bit of water before massaging it onto your skin. It is great at exfoliating dead skin cells and brightening the skin. Leaves skin feeling fresh, smooth, soft and moisturized. The Pure Body Naturals Arabica Coffee Scrub is made in the USA, it comes in an 8.8 ounce jar and is completely free of chemicals and preservatives. This product contains almost the same if not exactly the same ingredients as the previous scrub in this review such as Organic Kona Coffee, Coffee Arabica Seed Oil, natural oils, shea butter and granules of Dead Sea Salt. This company creates other popular skin care products all followed by a full money back guarantee. Product claims include the reduction of stretch marks and cellulite, fighting acne breakouts by gently exfoliating the skin as well as hydrating the skin and nourishing it with antioxidants. Moisturizes the skin leaving it softer and brighter. Doesn’t dry out their skin like some other scrubs. It has an invigorating scent. 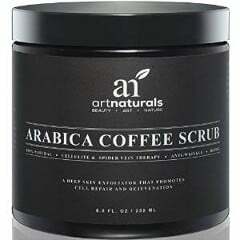 The ArtNaturals Arabica Coffee Scrub comes in an 8.8 ounce container and with 100% satisfaction guarantee. It contains such ingredients as Kona Coffee, Dead Sea Salt, Shea Butter, Sweet Almond Oil, Cocoa Extract, Coconut Extract and Shea Butter. It is sulfate and paraben free, cruelty free, made in the USA and both suitable for men and women. The company claims that it visibly minimizes cellulite on different parts of the body as well as exfoliates effectively without drying out the skin. It also helps improve the appearance of acne, varicose veins, eczema and Rosacea. In the case of Rosacea though, I would question the appropriateness of this product since it contains Dead Sea Salt granules which can be harsh on sensitive skin like the one that is prone to Rosacea. It hydrates while it exfoliates, leaving the skin fresher and smoother. It helps to improve their circulation. The skin feels clean and looks brighter and healthier. The scrub´s scent wakes them up in the morning, giving them a nice boost for the rest of the day. 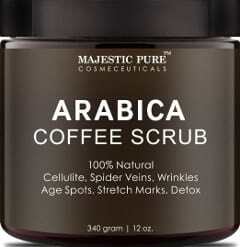 The Majestic Pure Arabica Coffee Scrub comes in a 12 ounce jar and is 100% natural. It is made in the USA and contains some different, compared to the previous products, ingredients such as brown sugar, honeycomb, vitamin E oil and Jojoba Oil. It is followed by a money back guarantee. Deep cleanses pores, leaving their entire skin looking fresh and clean. The skin feels softer and smoother. The scrub does not contain any chemicals, which is a real plus for those looking for natural skin care products. 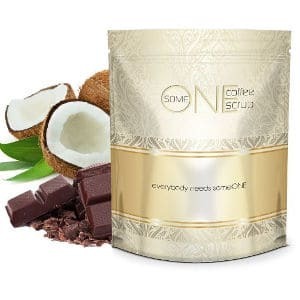 The SomeONE coffee scrub comes in a large 24 ounce container and contains such ingredients as Dead Sea Salt, coffee, olive oil, sweet almond oil, coffee Arabica seed oil, shea butter, cocoa powder and coconut shavings. The company claims that their product is good for cellulite, stretch marks, psoriasis, acne, varicose veins, scars and eczema. It exfoliates and hydrates the skin. Softens and brightens it, helping it to look and feel more youthful. In conclusion after reviewing some of the best coffee body scrubs, I would say that they all contain very similar, if not, in some cases, exactly the same natural ingredients and are free of chemicals and preservatives. 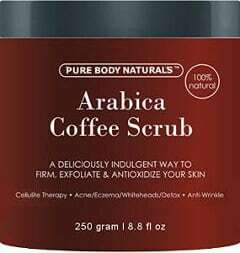 Also, user reviews show that a coffee body scrub might not be the miracle product to deal with cellulite, varicose veins or stretch marks but it can help improve the appearance of the skin, making it softer and smoother and this may make all these skin issues a bit less visible. All in all, it is simply a matter of picking the best product based on your budget, personal preference and the company’s reputation.